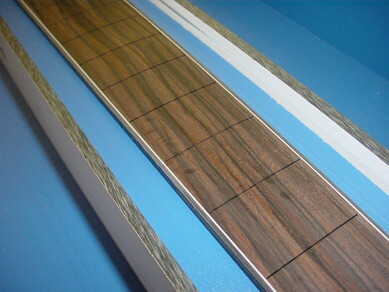 The fretboard is made of ebony and as always produced by myself. 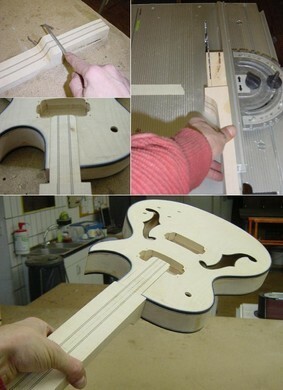 The scale is 24.562“ like on a ’59 Les Paul. 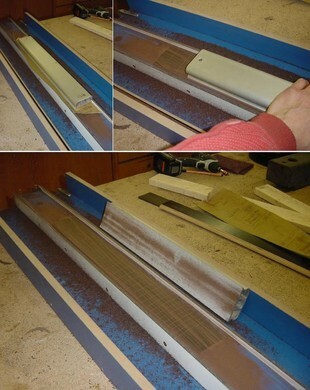 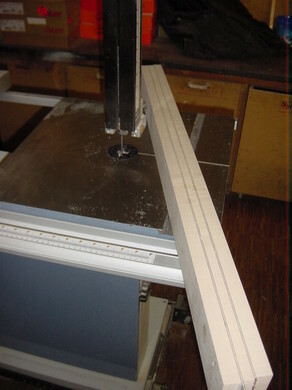 I was able to optimise the time needed for a fretboard with my self-built radius jig. 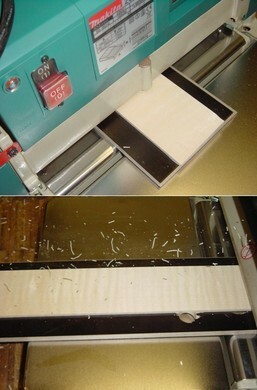 My nasal mucous membranes are extremely sensitive and very grateful when it comes to avoiding particulate dust. 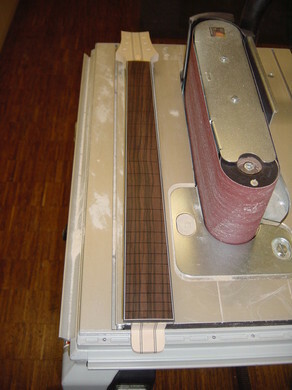 This dust shouldn’t be underestimated – I recommend everyone not to work without a descent dust mask. 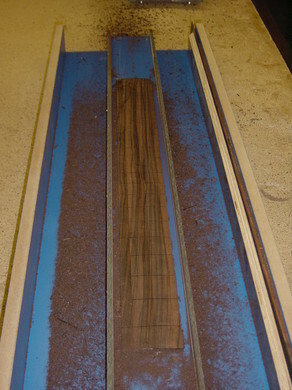 It doesn’t stop everything, but the major impact of dirt can be avoided. 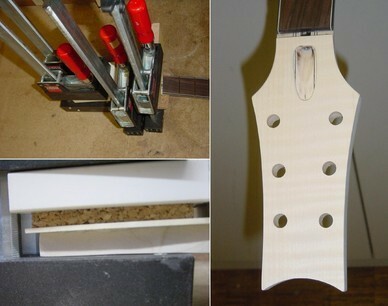 I make the neck from the earlier assembled neckblock. 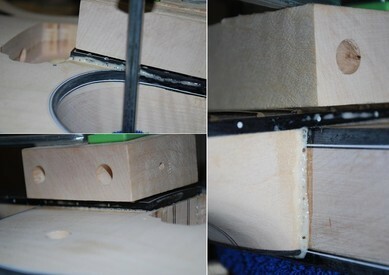 It is braced and I get two necks out of it. 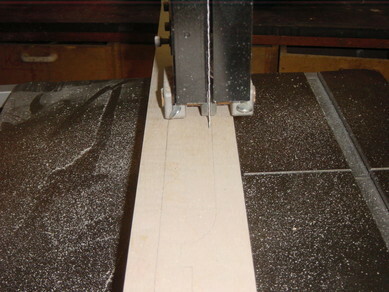 It is roughly cut out on the band saw and then everything is drawn onto it accurately. 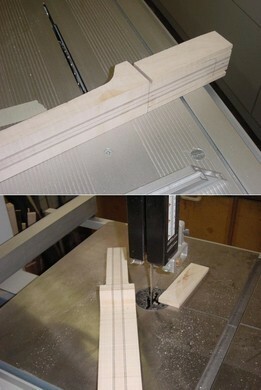 I also made the tenon earlier with the router. 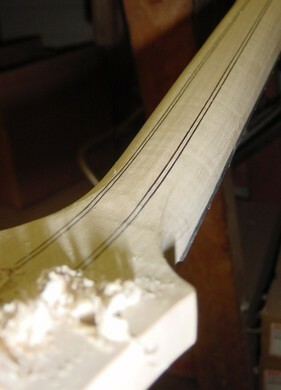 It takes a lot more time and has no advantage compared to fitting with a saw, file and chisel. 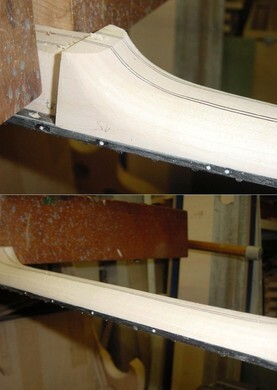 After the tenon is fitted it holds the full weight of the body without any glue. 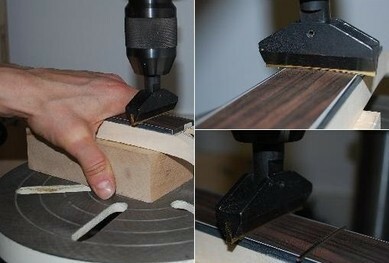 That’s the way it should be and proves good quality craft. 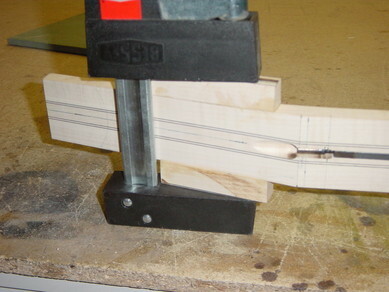 The trusrod is a two-way-rod which I preferably use. 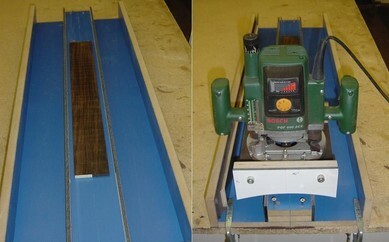 After routing and fitting the trusrod I put it aside to continue on the fretboard. 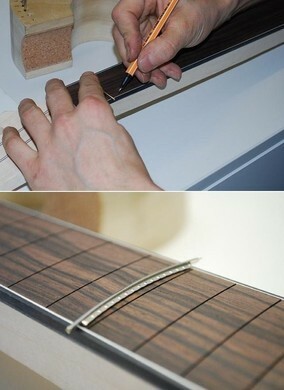 The fretboard gets a binding and is therefore shaped in advance. 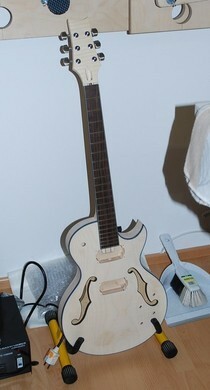 I do without inlays to preserve the instrument’s simple look. 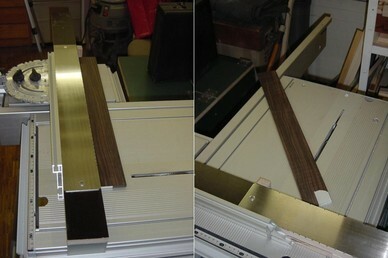 The double binding is glued on because acetone won’t work well on ebony. 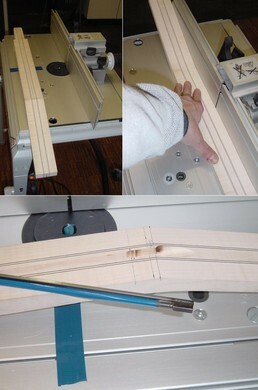 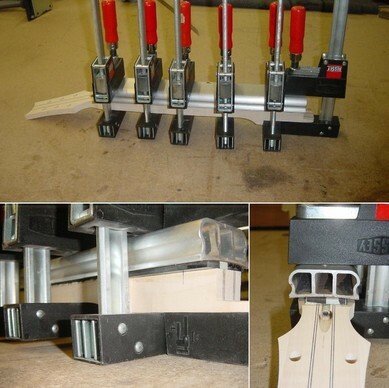 I press the neck between two strips with clamps. 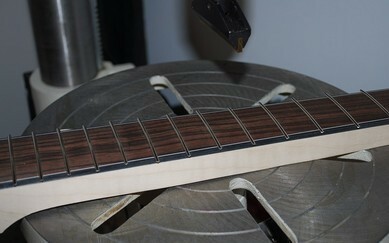 Before the gluing I do the fret job. 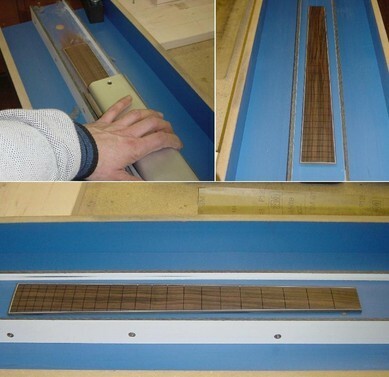 This way I can press in all the frets to obtain a very smooth fret surface. 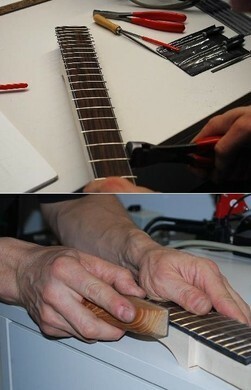 It’s a bit more work than a fretboard without a binding. 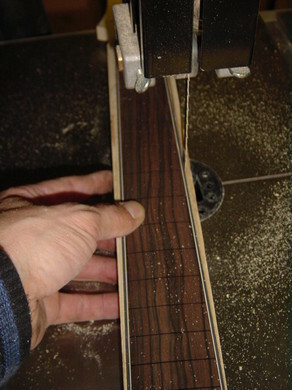 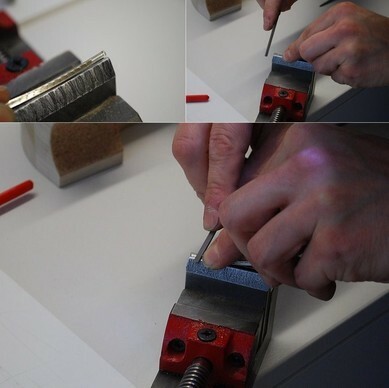 The fret ends have to be cut out and optimised with a file. 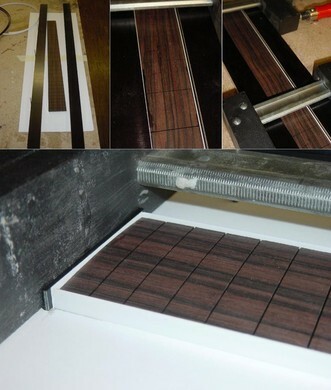 Next I press in all the frets. 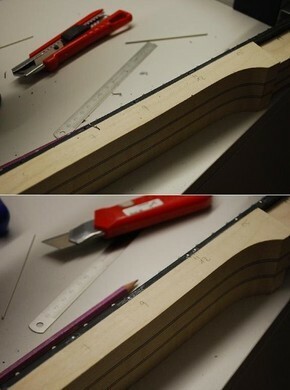 Adjusting the fret level follows after the neck has been glued to the body and everything has been pre-assembled. 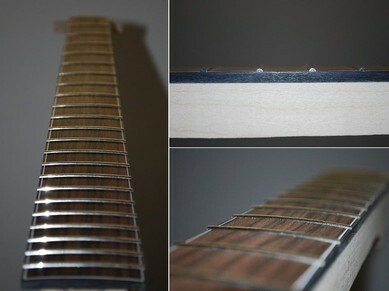 Finally I add the dots on the side of the fretboard for orientation when playing. 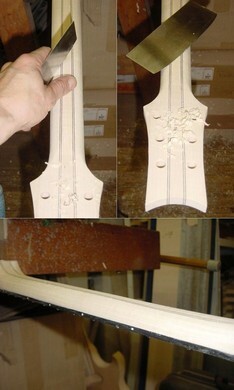 The shaping of the neck is done as usual with scraper and sand paper and finishes this part of the job.